What it is: Visual Studio is Microsoft’s coding tool for writing Windows programs, and now it’s coming to the Macintosh. For decades, every developer knew that if you wanted to make money, you learned how to write programs for Windows. While there are many programming tools available, most developers focus on Microsoft’s Visual Studio for writing programs in C#, Microsoft’s official programming language. C# is an improvement over C++ and meant to be safer than C++ while offering just as much flexibility. Yet with so many programmers familiar with C#, the big problem was translating their coding skills to the mobile world of Android and iOS. Since Microsoft’s own Windows Phone and Windows 10 Mobile has faltered in the smartphone and tablet market, C# programmers had to either use Java to write Android apps or Objective-C/Swift to write iOS apps. By releasing Visual Studio for the Mac, Microsoft now brings the world of C# programming to Android and Apple products. Visual Studio for the Mac is meant to keep programmers wedded to C# because then they’ll be able to use C# to write Windows programs, Android apps, or iOS apps. The more programmers who use C#, the more likely they’ll write Windows programs as well. So if you’re thinking about writing a program, Microsoft’s solution is to offer you C# so you can write programs for all the major operating systems in the world. If you learn Swift, you’ll get the power to write iOS apps, but your Swift programming knowledge won’t translate into letting you write Windows programs. If you learn Java to write Android apps, you can’t write similar Windows or iOS/macOS programs. Only C# and Visual Studio for the Mac offers you the chance to learn one programming language and be able to write for every major operating system. That’s the theory anyway. To play it safe, just learn C# and Swift. C# is Microsoft’s official programming language so you’ll be able to write Windows programs and if you also learn Swift, you’ll be able to write iOS, macOS, tvOS, and watchOS apps. The way Apple rapidly updates their operating systems every year, the only language that will support all the latest features will be Swift. Rather than learn just C# and try to write programs for Apple products, learn C# and Swift to make sure you can write for Windows and the world of Apple products. Visual Studio for the Mac is meant to keep C# relevant beyond the world of Windows. Swift is already relevant in the Apple world and because it’s open source, it’s spreading to other operating systems as well such as Linux and Windows. It may take time before Swift will let you write Android and Windows apps, but that’s what C# is for. Trying to learn one programming language to let you write programs for multiple operating systems is a fantasy that programmers have been chasing for decades, and they always come close but there’s always lots of minor problems. One programming language can never be fully optimized for all operating systems so you’ll always risk locking yourself out of certain operating system features. Visual Studio for the Mac is a great step forward for Microsoft since it brings C# programmers into the Apple world, which can only mean more software for Apple products. Just don’t expect Visual Studio for the Mac to be perfect for every operating system. To read more about Visual Studio for the Mac, click here. What it is: Neural networks is an artificial intelligence technique to model how the brain works in software. Artificial intelligence (AI) has been promised since the 1960’s, but it’s finally here. For the longest time, AI has been touted as the next big thing,b ut each time it’s proven disappointing. Early attempts at AI involved something called expert systems, which was nothing more than a series of if-then rules. The idea was to take an expert’s knowledge and translate them into multiple if-then rules. This required the use of a knowledge engineer who would act as an intermediary between the expert and the programmer. Once the expert system was designed, it would theoretically encapsulate the expert’s knowledge so others could query the expert system without bothering the real expert. The huge problem with expert systems was that they took too long to create. With a knowledge engineer working with a programmer and an expert, creating an expert system was a time-consuming affair. Even worse, once the expert system was done, it couldn’t learn anything new without someone manually modifying it. Since knowledge in any field changes rapidly, this meant the expert system would become increasingly obsolete over time. Eventually it would get so antiquated that it would be essentially useless. After all, how many people would want to take advice from an expert system containing medical information from the 1950’s? Because expert systems took so long and couldn’t be modified, they were largely ignored as too troublesome to create and too cumbersome to constantly update. That’s why AI remained absent from the commercial world for decades. 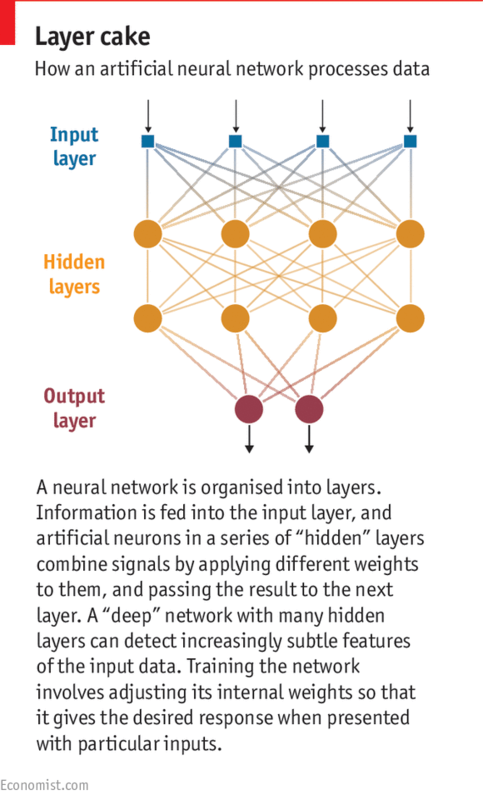 Neural networks are a different approach to mimicking artificial intelligence. The goal with neural networks is that they train themselves. Feed data to a neural network and it eventually learns from that data. This makes neural networks easy to create and easy to modify. Credit card companies use neural networks to monitor fraud. By studying normal buying behavior, a neural network can detect abnormal purchases from someone’s daily routine. Then the credit card company can let a human investigate further. Creating a neural network involves mathematical calculations, but Apple has now created a new software framework called basic neural network subroutines (BNNS), which is a collection of functions to implement and run a neural network. By creating this framework, you can easily create your own neural network without worrying about the details of calculations. This makes it easy to add neural networks to any macOS, iOS, tvOS, or watchOS apps you might create using Objective-C or Swift. The easier it is to create a neural network, the more likely developers will create them in their apps. That means more neural networks and more AI. By making it easy to create your own neural network, Apple has helped make AI more accessible for developers. This doesn’t mean we’ll necessarily have smarter devices, but it does mean we’ll have the power of neural networks in more apps. A long time ago, artificial intelligence could barely play a decent game of chess. Today, artificial intelligence and neural networks are picking stocks, checking for credit card fraud, looking for terrorists, and approving bank loans. To learn more about Apple’s software framework to make creating neural networks easier, click here.